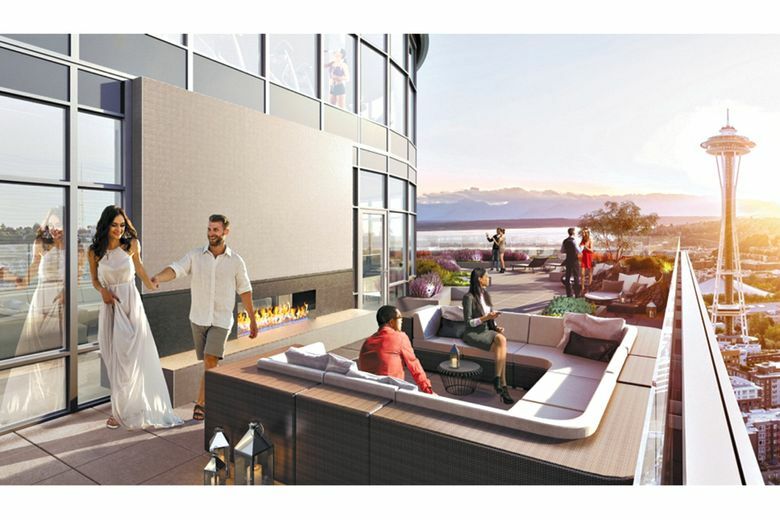 The SPIRE Club is a two-level amenity facility that features exterior terraces with entertaining spaces, fire pits and views of the nearby Space Needle. SPIRE will host a preview event on Oct. 13 to reveal new renderings, finishes and designer color palettes. SEATTLE — Advance design previews for SPIRE, a 41-story luxury residential tower being built in Belltown, will take place at a public open house on Oct. 13 at 11 a.m. The event will be held at Realogics Sotheby’s International Realty at 2609 First Ave. in Belltown. Prospective buyers will be offered a first look at the scale model, floor plans, interior renderings, finish specifications and designer color palettes. Brokers are also accepting reservations for priority presales ahead of the public sales debut, which is scheduled for later this month when the formal SPIRE sales center opens. A reservation requires a $5,000 fully refundable deposit held in escrow, and requires the developer to make an offer to the reservation holder once the final sales information is available. SPIRE is currently under construction, and occupancy is expected in winter 2020-21. 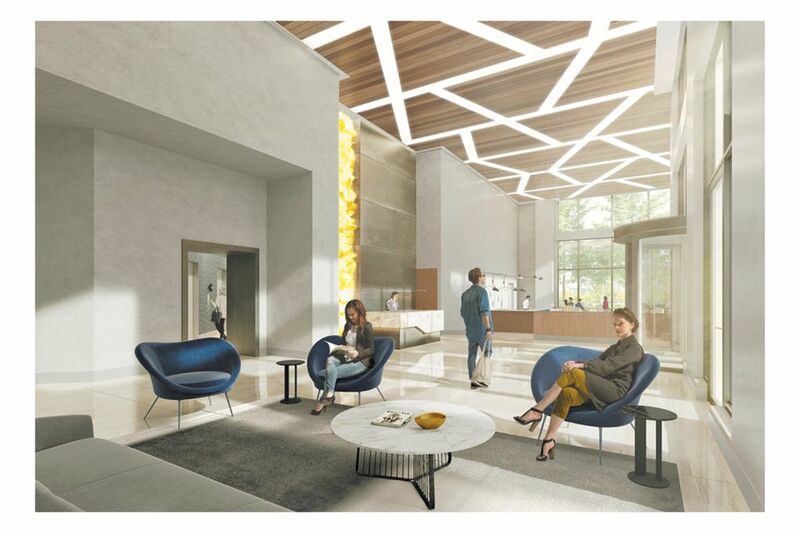 SPIRE will feature a two-story lobby with concierge services. The SPIRE preview center showcases the community’s 352 one-, two- and three-bedroom residences, which will range in size from an efficient 531 square feet to more than 2,800 (with the possibility of penthouse unit combinations). Introductory pricing ranges from less than $500,000 to more than $5 million. New details about the development’s robust collection of amenities and resident services were recently released. At street level, SPIRE will feature a two-story lobby with concierge services, and two unique auto ports will access Seattle’s first smart automated parking system, manufactured by Sotefin. Third-floor amenities include a co-working lounge, a gaming studio, a Skype room, a conference room, and a studio for yoga and spin classes. Above it all is the SPIRE Club — a two-level amenity facility that includes an exhibition kitchen and private dining area; a games room and bar; an art gallery; exterior terraces with barbecues, fire pits and entertaining spaces; and a fully appointed fitness facility with cardio and weight training equipment. SPIRE is poised to become the city’s first new, luxury high-rise condominium community in nearly a decade. Inspired by the shape, aesthetic and lucidity of a prism, SPIRE feature a tall-and-slender silhouette designed by VIA Architects. Featuring voluminous ceiling heights ranging from 9 to 10 feet, the interiors are inspired by the award-winning Robin Chell Design and include Italian-designed Pedini cabinetry, quartz countertops, Bosch appliances and Kohler plumbing fixtures. The homes boast engineered oak hardwood floors and solid-core 7- or 8-foot doors. Other options include either manual or electric window shades, closet-organization systems and home-automation features by Wipliance.